The dryblowing machine is almost as synonymous as the wheelbarrow with the 1890s Gold Rush and early days on the Eastern Goldfields. Water, the best medium for separating gold from “paydirt”, was so scarce that water races or sluices used on contemporaneous goldfields were out of the question. For example, on the well-watered West Coast of New Zealand, an engineer designed a water race for the Hohunu goldfields. That engineer’s name was CY O’Connor and conditions he encountered on coming to WA years later were to be quite the opposite. He had to find a way of supplying permanent fresh water for the Eastern Goldfields and famously recommended the pumping scheme (including the pipeline) that operates to this day. On the waterless Coolgardie goldfields before the pipeline, diggers used a technique known as dryblowing that takes advantage of gravity and the high density of gold and uses wind rather than water to separate gold from dirt. 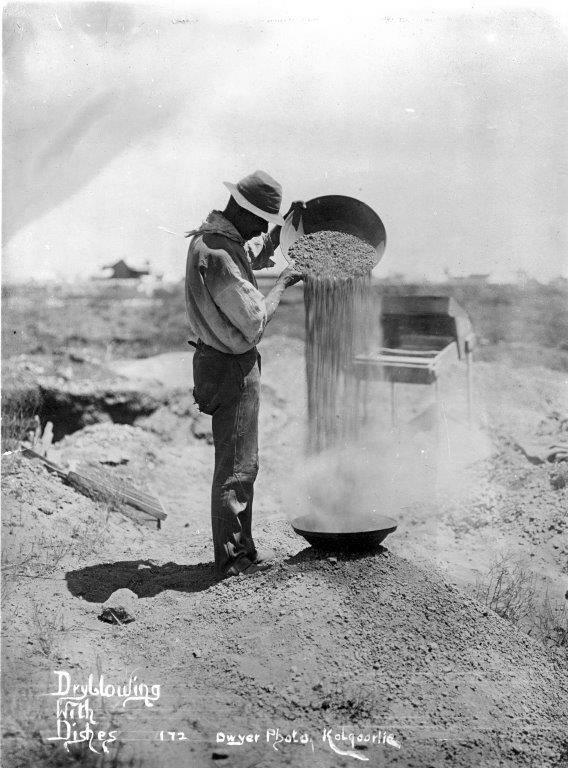 They had to find a way of extracting the precious metal that didn’t use the arguably even more precious liquid.Julius Price described what he saw round about Coolgardie in his 1896 publication The Land of Gold as the “rough, primitive method of ‘winnowing’ the alluvial ground”. Battye Library. Dryblowing with dishes. With hundreds of prospectors on the fields the clouds of dust emanating from dryblowing were visible from a great distance. Apparently dryblowing could be heard as well as seen. In Coolgardie Gold Albert Gaston wrote I could see from my camp numbers of men working on a flat, and as I approached them I could hear a peculiar sound. Great clouds of dust were rising from the scene of their operations. The dryblowers were at work and the sound was made by them pouring the wash dirt from one dish to another. The better-equipped prospector had “Rockers’ or Shakers”. These contraptions were flexible frames with a series of trays and screens which, when shook vigorously, allowed the dust to blow away, leaving the heavier gold in the bottom. The terminology is not exact but strictly speaking what distinguished a “shaker” from a dryblower (the machine rather than the operator) was the addition of a bellows. So the dryblower is thought to be an improvement on the shaker. Operated by foot, the bellows blew away fine dust leaving the larger grains and slugs of gold. Some called “Rockers and Shakers” are very crude affairs, being simply a series of square sieves which are rocked from side to side, or being set on flexible legs are shaken backwards and forwards. As a rule no attempt is made to save gold finer than a pin’s head. The best machines have, besides the rocking motion a pair of bellows which keeps a blast of air going through the machine. Dryblowing was not actually a WA invention but was perfected on our fields. Arguably Teetulpa in South Australia in the 1880s was the testing ground for dry blowing techniques. The Adelaide Advertiser of October 22, 1891 carried news of a machine invented by a Mr Paynter that offered a fast efficient dry method for extracting gold from alluvial ground. Paynter machines were later used in WA and the basic design copied by other manufacturers. You can usually see a wonderful example of a dryblower in the Kalgoorlie Museum. What makes it particularly special is that it is a Lorden dryblower, manufactured in Fremantle and the frame is U-shaped, all the better to fit over a camel’s hump! Battye Library. Dryblowing with Lorden Blower. But while they complained about dust, dryblowers hated mud even more. The rains of July 1893 saturated the ground to such an extent exasperated diggers had to dry the dirt for three days before dryblowers could be used. 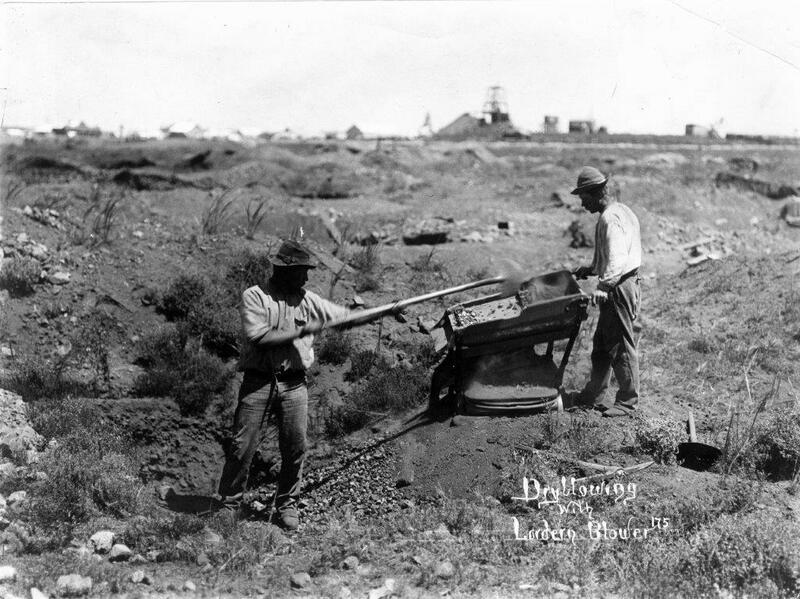 Sunday was the only day diggers took off work and they used it to rid themselves of the red dirt encrusting them and to beat it out of their clothes. Some went to church. A favourite “round” about dryblowers (men, not machines) was sung at Salvation Army meetings in their Coolgardie Hall, to the tune and metre of “Three Blind Mice”.